Receive 50% off your rescued pets first preventative care exam. If you refer a friend who schedules an appointment, you both receive a $25 credit on your account! We offer discounted services to Military, Police and Fire personnel and local area rescue groups. Read more about our wonderful team of caring veterinary professionals. 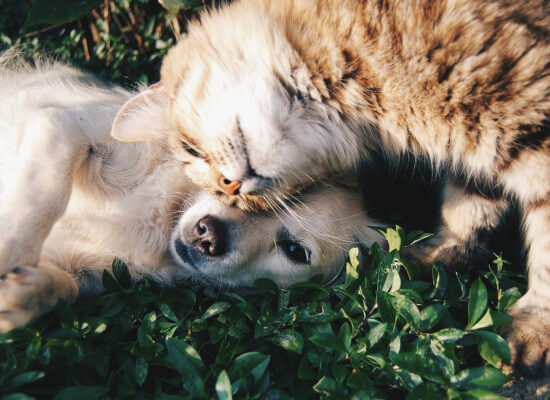 At 4 Paws Veterinary Care we understand the special place your pets have in your family as we partner with you to keep them happy and healthy throughout their lives. By providing care based on each individual pet’s lifestyle we assure the best overall physical, mental and emotional health of your pet. Our friendly, professional team is dedicated to meeting the unique needs of the various stages of a pet’s life by providing full-service, quality health care. Surgery, boarding, grooming, bathing, certified dog training, feline-friendly care and doggie day care are just the beginning of how we care for your pets at 4 Paws. The level of compassion from our team is shown each day as they focus personal attention on the concerns of each individual pet owner. From cuddling with a pet recovering from anesthesia, to creating a pain management plan for an arthritic pet, to advancing knowledge and expertise through continued education, we are completely committed to the best for your pet. Our motivated, energetic team extends a warm welcome to new, current and returning clients. We are located in Wynantskill, NY serving the surrounding areas of Troy, Rensselaer, East Greenbush, North Greenbush, Sand Lake and West Sand Lake, Averill Park, Nassau, Brunswick and Poestenkill.